In the recent development, Samsung Galaxy A7 has now been spotted online. This new smartphone comes with new specifications. Samsung Mobile. News has reported about this thing with a leaked image of Galaxy A7, and it also claims to have the image of the Galaxy A9 Star Pro. Both these new smartphones are said to be getting launched at an event held by Samsung on 11th October. As per the leaks, it has also revealed that there are some specifications about the Galaxy A7 (2018) in their tweet thread. This link includes a leaked image of the smartphone, and this all-new leaked image of this smartphone shows that vertical stacked triple rear camera that comes with a flash module which is set up below the camera setup. The all new Samsung Galaxy A7 (2018) will be running on Snapdragon 710 or Snapdragon 660. But some of the reports shows that the phone will be running on Exynos 7885 processor which will come with packed 4GB RAM for some selected markets which may include India in it too. The leak also reveals that the phone will be having a waterproof as well as dust proof feature in it. The new Galaxy A7 (2018) is said to get a 5.7 inch Super AMOLED Infinity display. The rumors are said to be over the processor which are split between an octa-core Exynos 7885 processor and also Snapdragon 710 or Snapdragon 660 which was paired with the 4GB RAM. This leak will be Galaxyclub.nl which suggests that the phone will be receiving the certification of waterproof as well as dust proof. The internal storage will be expandable with the help of microSD card. The phone will be running on Android 8.1 Oreo. The leak renders shows that the smartphone will have the two color options. These two colors are black and blue. 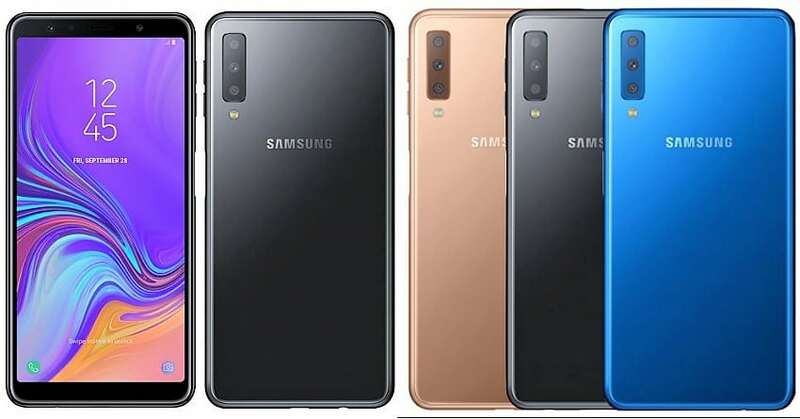 When it comes to the price tag of the Samsung A7 (2018), it is expected that it will be cost around USD 407 or about Rs 29,650. The phone will be reaching the Indian market in October 2018. Apart from this, there are also rumors which are about the Samsung Galaxy A9 Star Pro. This phone will be coming with one extra camera sensor than the Galaxy A7 (2018). The phone will be getting a Bixby button along with a curved rear panel and fingerprint sensor present in the center.